A new version of one of my Digital Nostalgia posters with some new information and fitted into a magazine format. 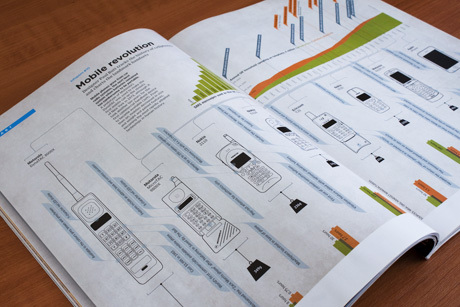 This spread shows the major milestones of mobile phones, not just in technology, but in social importance. They range from the very first commercial model to the beginnings of mainstream consumer adoption and on to the best selling models of their generation. Published in Wired UK, February 2010 issue.